Happy Kitchen Sink Stamps Monday, thanks for stopping by today! Sometimes when creating, less is more, and I feel that is especially true when creating Sympathy cards. 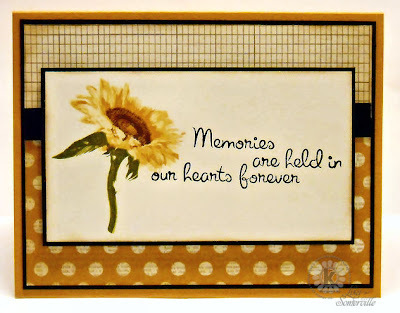 Here I've combined the sentiment from Kitchen Sink Stamps 3 Step Daisy, along with the beautiful sunflower from the Multi Step Sunflower set, stamping the images, then lightly sponging on Chocolate ink and layering on some My Minds Eye papers. Your card is gorgeous, Lisa!! Love the beautiful browns with the delicate yellow of your sunflower! That sunflower is just so perfect! I love it! Oh How i agree! this card is georgous. Simple and elegant at the same time Lisa...your card is beautiful! Beautiful combination of papers and stamps. Lovely card! Beautiful. Love the warm rich colors in your flower and papers and the design is perfect. I have GOT to get back into my stamps! Beautiful sunflower Lisa! I love the mix of those patterned papers! Fabulous design!